When will the fast forward feature be added to the new Opera? This is one of the best features around. The devs have not announced if or when this feature will reappear in the new version of Opera. I don't think that this feature will ever return. This feature, definitely, "too geeky". I think i almost never used this feature in a website. I've used it occasionally, but I definitely use rewind all the time. I'm using both, Rewind more, FastForward only on few sites - but that is almost required there (this is one of reason why I'm keeping older Opera). Whena website has multiple images to view, this feature allows you to quickly move to the next image and in full mage size too. Without this feature you have to individuall open each individual image. Very usefull. IE and he other browsers don't have it. If more people knew about, then more people would want it and Opera can be ahead of the pack. How can I create my own fast forward feature in the new Opera? By programing an extension from scratch the incorporates that feature. Just so you know, its not a trivial thing to do. Thats why it didn't always work in Presto Opera and very few (none?) other browsers have it. It worked extrememly well in Opera 12.17. So why the problem? I would pay money to have a browser have that feature. Hear that, MONEY. ... and I did not forget the k.
For what reasons they should restore this unpopular feature? 99% of a mainstream browsers (IE, Crome, stock FF)users never had an idea about it. For comfort feature set use old Opera or Firefox with extensions (there is FastForward extension, AFAIR). Money huh? How much does a programmer make per hour? Now how many hours would it take a programmer to write that feature to work with the new rendering engine? Multiply the first by the second and thats how much money you'll need to pay. Honestly I don't see it happening anytime soon. Theres far more people complaining about how the sidebar, keyboard shortcuts, an email client, and stupid Bing as a default search engine are more important that this and those aren't even things that the Dev team has said are that important. Where is the code for the fast forward feature in the old opera? How would I develope my own button in the new Opera? Is there a way for me to see the code for the fast forward feature? Can you put me through to the developer? Extensions are ZIP archives. Unpack them and inspect the source. Or start Opera Developer Tools and select in Sources the extension code. atng on jan 16 says that the fast forward feature is not popular. Thats is a dumb answer. When you have a web site that lists mutiple images, like jpegs, it is much easier to open one image and fast forward to the next, rather than closing the window/tab and opening the next image and so forth. Fast forward is a good feature. Its jsut that the developers went ahead and did their own thing without any consideration to the OPera 12.17 feature popularity. Selfish nerdheads. Useful and popular are not the same word. Anyway, you are free to re-add the feature to the browser yourself. We eagerly await your creation of an extension that will add this feature to the new version of Opera. You probably don't understand the conception of Opera/Blink. An average users of Chrome, IE and Firefox who have never heard about FastForword feature, simply never used it. A non-experienced and not exacting users now the main target audience for Chropera. The most of a mainstream users simply don't care about features (that are too "geeky", advanced and non-standard) in their web-browsers . 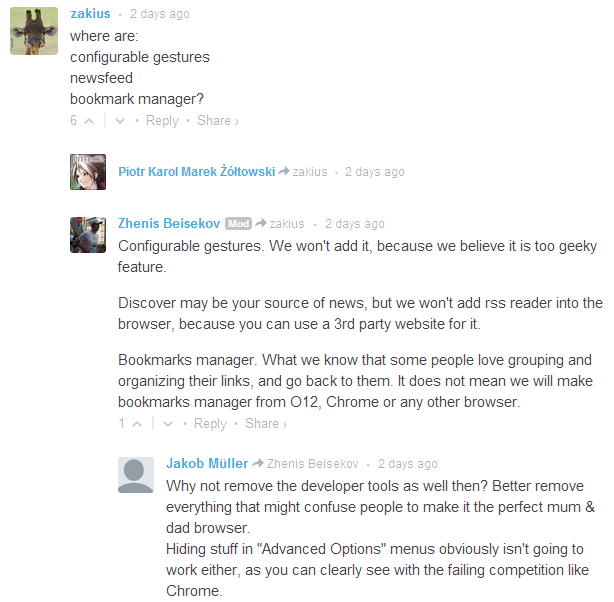 For what reasons Opera should implement an extremely low popular features such FF, FTW, bookmarks manager, customizable UI and controllability etc.? It costs a lot of man-hours and money. To satisfy a marginal part of users? What is Opera/Blink and Chrapera?